WASHINGTON — President Obama nominated former energy company executive John Bryson as his new commerce secretary yesterday, a relatively low-profile choice for carrying out the president’s efforts to speed up the nation’s tepid economic recovery. Bryson, who spent nearly two decades as chairman and chief executive of the major electric utility Edison International, the parent of Southern California Edison, has a large footprint in corporate America. He is a senior adviser to Kohlberg Kravis & Roberts, the big New York private-equity firm, and serves as a director of Boeing and Walt Disney. 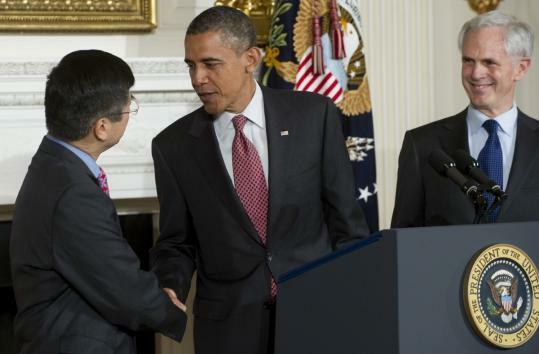 Bryson will replace Gary Locke, whom Obama recently named as ambassador to China. The president was said to have considered Google chief executive Eric Schmidt and US Trade Representative Ron Kirk for the commerce job. The nomination requires Senate approval. If confirmed, Bryson will be pushing the administration’s goal to promote export-driven economic growth. Obama has been aggressively courting corporate America over the past year, naming former commerce secretary and J.P. Morgan banker William Daley as his chief of staff. In a statement after the announcement, US Chamber of Commerce president and chief executive Thomas J. Donohue said his group “looks forward to working with Secretary-nominee John Bryson to fulfill the department’s mission of creating jobs, enhancing US competitiveness, and spurring American innovation. “With his extensive knowledge of the private sector and years of experience successfully running a major company, we hope Mr. Bryson will be a strong voice for American businesses,’’ Donohue said. Bryson could also lend a hand in furthering Obama’s new energy agenda, which includes rolling back tax subsidies for oil companies and investing in alternative forms of energy. Bryson, an advocate of nuclear energy, has served on the board of the industry’s policy group, the Nuclear Energy Institute. Southern California Edison operates the San Onofre nuclear plant in San Diego. His environmental activism could generate opposition among some Republicans. Senate Republicans have resisted approving Obama’s nominees and have demanded that the president submit free trade agreements with Korea, Panama, and Colombia for approval. In a March letter to Senate Majority Leader Harry Reid, Democrat of Nevada, Republicans demanded that the president submit the trade pacts before they vote on nominees. “We will use all the tools at our disposal to force action, including withholding support for any nominee for Commerce Secretary and any trade-related nominees,’’ the letter said. Bryson’s resume includes serving as president of the Public Policy Institute of California and chairing the boards of BrightSource Energy and the Keck School of Medicine of the University of Southern California.